The urban agglomerations, urban sprawl and allied urban growths are symbols of constructive developments of India. However, the environmental concern, mosquito nuisance and urban malaria have become a big challenge in the country. The annual prevalence of malaria was estimated 75 million and the death rate was 8 lakhs in 1953, and it gradually reduced to 1.04 million cases and a death rate was 890 in 2006. Though a significant result was obtained by national malaria programmes, the urban malaria is still persisting as a challenge in the country. The public health departments are adopting various vector control measures and applying appropriate disease strategy for implementing the different way of control measures for controlling both the vector control and the vector borne diseases especially malaria in the urban areas in all over the country. The conventional way of assessing the malaria vector mosquito problems in an urban area at a particular time point is not possible because, it is time consuming, less accurate, huge expenditure, and is employing enormous manpower (Allen W et al 1998, Rahman, A et al 2006, and Booman, M., D et al 2000). Currently, the public health programmers and the environmental scientists are choosing remote sensing, GIS and GPS technology for delineating mosquitogenic conditions and linking the urban land use / land cover variables with mosquito abundance and the malarias (Sharma V.P. et al 1996, 1997 ), examine the close association between the environmental changes and the malaria prevalence (Roberts, D. R, et al 1994, Tran, A., N. et al., 2008, Vasconcelos, C. H et al 2006, ) and the influence of climate variables and malaria epidemics (Cross, E. R et al 1996). The applied remote sensing and GIS have the significant role in giving meaningful solution to the programmers for the malaria control (Allen W et al 1998, Rahman, A et al 2006, and Booman, M., D et al 2000) in the replacement of conventional way of spatial assessment of problem of Plasmodium falciparum and P. vivax malaria in metropolitan cities. The application of remote sensing, GIS and GPS are not only used for identifying, delineating and mapping the mosquitogenic conditions, but it was also applied for the study of spatial relationship between the occurrence of malaria cases and the environmental variables (Hay, S. I et al 2000, Goetz, S. J et al 2000, Sharma et al., 1996, 1997, Rossi RE et al., 1992, Vaz, F. S.,.et al 2007). To study ward wise mosquitogenic conditions in the Vizag City, India. To analyse the spatial relationship between the potential breeding surface of the malaria mosquito and ward wise malaria cases. 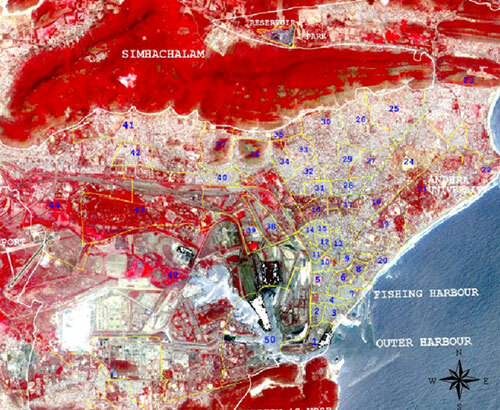 To study the spatial relationship between the land use/ land cover categories of satellite data and the malaria cases. Vizag City is the second largest most important industrial and port city of Andhra Pradesh state, which is located in the eastern coast of India and well connected by roads and railways with other parts of the country. The city corporation is divided into 50 numbers of wards and which are numbering from 1 to 50 (Fig.1). The total geographical area is 100sq.km. The ward No.15 has the lowest geographical area of 13.85 Ha, and the ward No. 49 has highest geographical area of 1946.87 Ha. The total population of the city is 1.3 million (approximately) and the average population density of the city is 2658 per sq. km. The city is experienced with 220 C minimum temperature and 340 C maximum temperature. The city is receiving rainfall by both southwest monsoon and northeast monsoon and it receives annual average rainfall 955 mm. The geographical location of the city is lies between 170 42’ 56” N and 830 16’ 42” E. The average elevation of the city area is 16 feet Mean Sea Level (MSL). 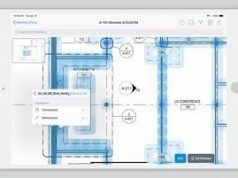 A digital map of Vizag city ward boundary was prepared on 1:25,000 scale using Arc View 3.2, Arc View Spatial analysis and Arc View image analyst GIS software. 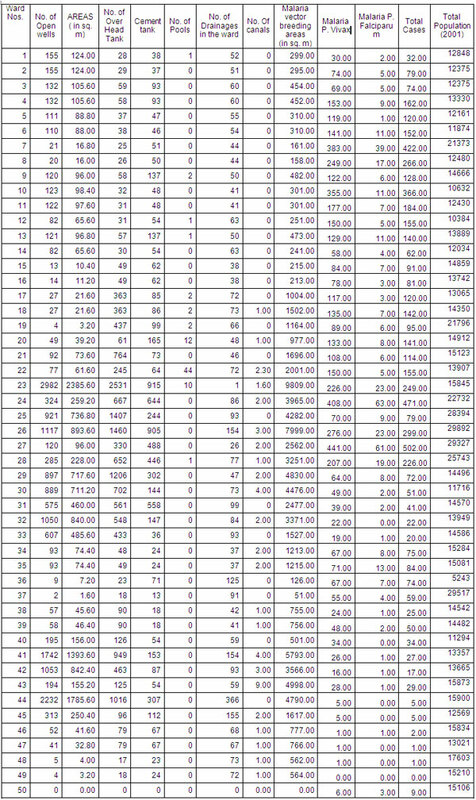 Ward numbers were also indexed in the map. The malaria cases of both P.vivax and P. falciparum were collected from the department of entomological survey, Vizag city corporation, Andhra Pradesh. The database of ward wise P. vivax and P. falciparum malaria cases was developed and were imported to the GIS platform for digital mapping. Malaria mosquito potential breeding surface area was calculated for the each ward and it was mapped with graduated colours. GARMIN 12XL GPS unit was used for the collection of water level sample points for mapping ground water level. The random sampling procedure was applied for the ground water samples and 21 samples of both winter and summer season were collected from all the 50 wards and they were mapped on the ward map at 1: 25,000 large scale. The India remote sensing satellite data of IRS 1D PAN (5m spatial resolution) and LISS III data (23.5m resolution) was used for digital image processing of the land use/ land cover classification. 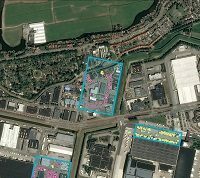 A derived land use/ land cover image of the study area with 5m X 5m resolution is obtained from a systematic value added hybrid colour composite image classification of the merged product of the IRS PAN and LISS III was carried with high spatial resolution of 1:25,000 map scales. The land use land cover areas were calculated and the characteristic of the image was analysed with the mosquitogenic conditions and the malaria cases. Detailed ground truth / field verification was carried out using GARMIN 12XL GPS for reexamining, checking, land use/ land cover categories and the interpolation of water level with mosquitogenic condition and malaria cases in different time points (Table.1). This study was designed to address the malaria mosquito problems and potential malaria mosquito breeding surface areas including the open wells, over head water tank, pools or tanks, reservoirs or lakes, rivers and streams, and canals. 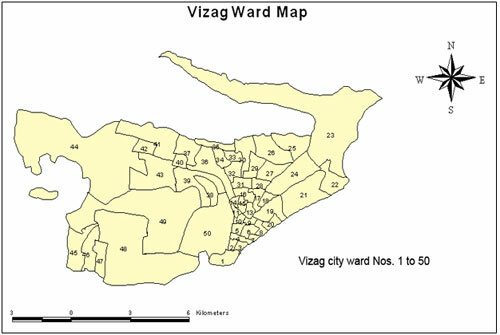 The total surface areas of each land marks were correctly calculated and the data was attached to the ward base map of the Vizag city. 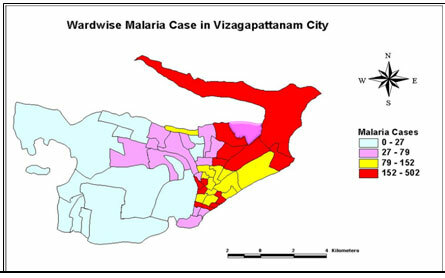 A systematic digital mapping of each variable was digitally mapped and it was superimposed with ward wise malaria cases both P.vivax and P. falciparum. A spatial topology was made for ascertaining the spatial relationship between the malaria cases and the environmental variables. It was observed that the disease patterns have a spatial autocorrelation and a close association with the urban environmental sanitation, water supply, waste disposal, housing patterns, housing density, mosquitogenic condition, and urban land use / land cover classes of remote sensing images (Fig.2). Vizag city has the features of hill ranges, isolated hillocks, coastal stretch, Industrial areas, old city dense settlements and the low lying marshy areas. The city is classified in to four major categories based on the land use / land cover classes. (i) coastal region with dense human settlements, (ii) dense population in the foothill areas, (iii) marshy areas / industrial areas with low density population settlements (iv) semi-urban in the peripherals. The scientific approach of the spatial analysis of superimposing the thematic information by importing the layers of maps to the GIS software, the classification of the areas for ward wise priority for implementing the malaria mosquito control program in the city has significant result. Ground water level samples were collected for the monsoon (October) for the mapping the ground water level. Because of the problem of malaria transmission was persisting mainly during the monsoon season. 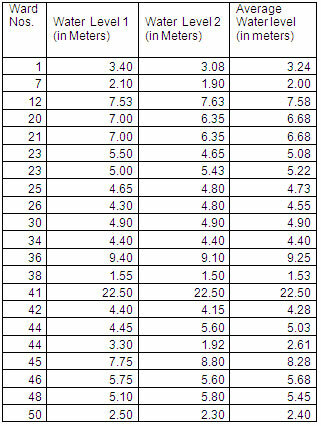 Totally, 21 samples sites randomly selected for ground water level and 2 samples from sites were collected (Table. 2). GARMIN 12 XL handheld GPS instrument was used for registering the coordinates of the each sample sites. 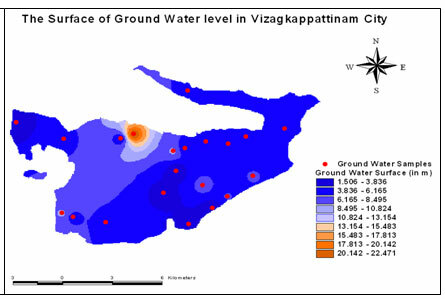 The average value of 2 water sample of the each sampling sites were collected for ground water level calculation and which were imported into the ArcView Spatial Analyst and ArcView 3D analyst GIS platform for mapping the ground water surface levels and these point values and which was interpolated for mapping contours of water level and created ground water surface by spatial analysis of inverted distance weighted (IDW) methods using the nearest neighbourhood analysis of 12 samples with weighted value of 2 for each sample sites for creating the contour interval of 2metres contours of ground water surface levels of the entire city (Fig.4). The environmental sanitation by the city corporation and maintenance of the waste disposal are good. Corporation very well maintains records of housing, water supply, environmental sanitation, waste disposal, malaria mosquito entomological data, and malaria cases. However, the severity of malaria endemic in the city is problematic and uncontrolled and the malaria situation in the city is influenced by many factors. Vizag city housing pattern is irregular and congested. The combined influence of mosquito breeding surface areas, water logged areas, pools, canals, river and streams, cement tank, over head tank, high ground water surface level, etc., are fuelled to the increase of malaria cases ( Malaria P. vivax (Fig.5a) and P. falciparum (Fig.5b) cases.. The thematic layers of mosquito breeding surface areas, ground water surface level, and malaria cases were superimposed on the ward base map with 1:25,000 large scales and land use/ land cover classes of satellite image with 5m X5m high spatial resolution for performing the spatial analysis for obtaining the result map of priority areas for vector and disease control, using Arc View spatial analysis and Arc view Image Analyst software. The result obtained from the spatial analysis, three major areas was classified as priorities 1, 2 and 3 for the control operation (Fig.7). Thus, based on the priorities of the areas or the wards have to be chosen for implementing the malaria mosquito control measures with appropriate control strategy. 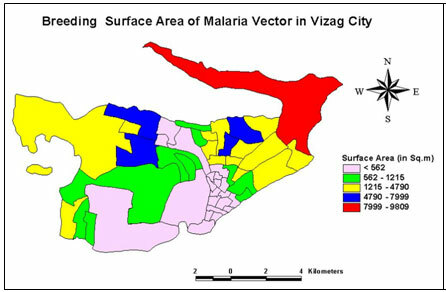 The application of remote sensing, GIS and GPS are usefulness for detection, identification, delineate and mapping the mosquito potential breeding surface areas and studying the mosquitogenic conditions in the city and giving meaningful spatial solutions and usefulness in the important decision making for implementing the ward wise vector control operation. The land use/ land cover classes of the study area on 1:25,000 scale image derived from a systematic value added hybrid colour composite satellite image processing of the merged product of the IRS PAN and LISS III with of 5m X 5m high spatial resolution is providing reliable, accurate and significance results for mapping the mosquitoes breeding potential areas which are fueled and supporting for malaria transmission in the city. 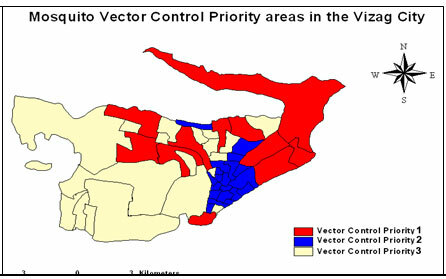 Remote sensing and GIS based derived map is giving spatial solution map of priority areas 1, 2 and followed by 3 is finding the usefulness for controlling the both vector and disease control in the city (Fig.7). 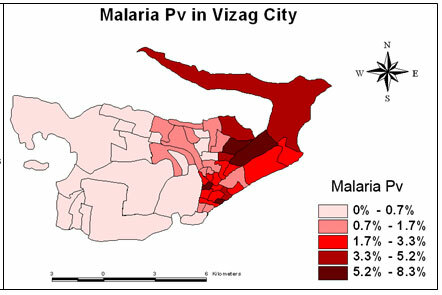 Based on the results, the following areas was classified into four major categories and which was recommended for control operation for malaria mosquito control measures in the given areas on the basis of priorities of the map result of the present study (i) Coastal region with dense human settlements, (ii) Dense population in the foothill areas, (iii) Marshy areas / Industrial areas with low density population settlements and (iv) semi-urban in the peripherals of the metropolitan. The author are grateful to the Director, Vector Control Research Centre, (ICMR), Pondicherry, India, for providing facilities, encouragement and granting permission to carry out the research study. The authors are thankful to the Director, Regional Remote Sensing Service Centre- Bangalore, NNRMS, ISRO, India, for providing remote sensing laboratory facilities for image processing and land use analysis of satellite data. The staff members of VCRC, Pondicherry, India, and the staff members of RRSSC-B, ISRO- Bangalore, India are appreciatively acknowledged for the helpful assistance in the data collection, field studies and the image processing of satellite data. Allen W. Hightower, Maurice Ombok, Richard Otieno, Richard Odhiambo, Aggrey j Oloo, Altaf A. Lal, Bernard l. Nahlen, and William A. Hawley. 1998. A Geographical Information Systems (GIS) applied to a malaria field study in western Kenya, Am J Trop Med Hyg 58 (3): 266-272. Beck, L. R., M. H. Rodriguez, S. W. Dister, A. D. Rodriguez, E. Rejmankova, A. Ulloa, R. A. Meza, D. R. Roberts, J. F. Paris, M. A. Spanner, and et al. 1994. Remote sensing as a landscape epidemiologic tool to identify villages at high risk for malaria transmission. Am J Trop Med Hyg 51 (3):271-80. Booman, M., D. N. Durrheim, K. La Grange, C. Martin, A. M. Mabuza, A. Zitha, F. M. Mbokazi, C. Fraser, and B. L. Sharp. 2000. Using a geographical information system to plan a malaria control programme in South Africa. Bull World Health Organ 78 (12):1438-44. Goetz, S. J., S. D. Prince, and J. Small. 2000. Advances in satellite remote sensing of environmental variables for epidemiological applications. Adv Parasitol 47:289-307. Hay, S. I., J. A. Omumbo, M. H. Craig, and R. W. Snow. 2000. Earth observation, geographic information systems and Plasmodium falciparum malaria in sub-Saharan Africa. Adv Parasitol 47:173-215. Roberts, D. R., and M. H. Rodriguez. 1994. The environment, remote sensing, and malaria control. Ann N Y Acad Sci 740:396-402. Rahman, A., F. Kogan, and L. Roytman. 2006. 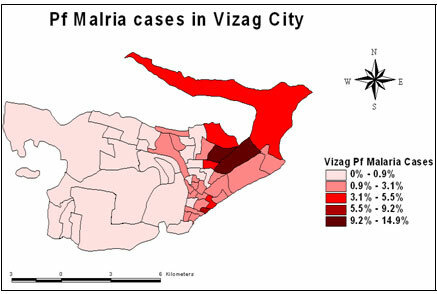 Analysis of Malaria Cases in Bangladesh with Remote Sensing Data. Am J Trop Med Hyg 74 (1):17-19. Sharma, V. P., R. C. Dhiman, M. A. Ansari, B. N. Nagpal, A. Srivastava, P. Manavalan, S. Adiga, K. Radhakrishnan, and M. G. Chandrasekhar. 1996. Study on the feasibility of delineating mosquitogenic conditions in and around Delhi, using Indian Remote Sensing Satellite data. Indian J Malariol 33 (3):107-25. Vaz, F. S., A. M. Ferreira, D. D. Motghare, and M. S. Kulkarni. 2007. Conceptual framework of a geographical information system for environment–public health surveillance in Goa. Indian J Public Health 51 (1):64-5. Note: Dr.T.Mariappan, second author, who was working at Vector Control Research Centre, Pondicherry, India when the project was carried out and presently he is working at the Centre for Research in Medical Entomology (CRME), Madurai, India.